Wander forwards until you talk to a sleeping Mabu, after chatting with him use the bounce pad to the left to reach a bomb on the building behind him. Throw the bomb at the gate below (the Giant icon indicates that a Giant type Skylander can smash through the gate without bothering to get the bomb. There's a couple of Chompies and a sword swinging Raven Slicer ahead, get rid of them and then smash the Traptanium Crystal to collect the Treasure Chest 1/5 next to another sleeping Mabu, you need to use a Trap Master to smash through the crystal to get to the chest beneath. From now on each of the main levels will have one or more chests blocked by Traptanium but that is the only thing that is specifically tied to Trap Masters. Go right over some wooden planks and next to a building you'll find Nightmare Page 1/3 all about Spike McPokerton, someone who you'll see as soon as you walk closer to the building's doorway. A few Buzzer Beaks and a Raven Slicer will attack you, once they're defeated go inside. After clearing out the Chompies use the bounce pad in here to get up onto the ledge at the back and get outside, you'll find the Tech Elemental Gate out here, draw the Tech symbol to get in. Follow the conveyor belts to the right to a switch, pull the switch and a blockage will lift. Run along the conveyor belts again then to the right over some gaps and around up to a second switch. That'll lift a second gate, go through and then make your way up around to a third and final switch which lifts the third gate and lets you reach Hat 1/3. No need to go back inside, just jump off the side and go across the spike traps. To get the key you just ride the yellow platform over to it, instead of riding it back drop off the platform to the area below to find Hat 2/3, use the bounce pad to get back up to the gate to unlock it. Inside the building on the corner are a few enemies and Treasure Chest 2/5. Go out and to the right onto a yellow platform, a very short distance along you'll want to get that Treasure Chest 3/5 before getting back on and continuing to the right where you'll be attacked. A few waves of enemies will appear, ending with a Cross Crow who fires a crossbow bolt at you occasionally. Once they're all defeated approach the door with a circular picture on it and press R. This is a Lock Puzzle, in it you need to connect the dots of the same colour together, easy when there's only two dots but it gets a tiny bit more complex later on when they add a third (not much though). The general idea with these things is to look for ways to join the dots together without blocking the joining paths of other dots. Unless you're using a Giant, ride the yellow platform across to a bomb and use it to destroy the gate below. Go outside and before crossing the spikes move towards the screen and to the left to find a Traptanium Crystal with Treasure Chest 4/5 underneath. The spikes require you to start going over them as soon as the near one drops as they'll never all be down at the same time. A few Chompies on the other side to take care of before riding a yellow platform to a second yellow platform and across. Follow the curve around to a small village, use the bounce pad on the right to get up to a yellow platform at the back of the building to reach Nightmare Page 2/3. Back over to the village go into the right house, defeat a few enemies in here and grab the key from the back. Go out and into the left house to do the same there except that once you've got the key jump up the ledge behind it and out the door at the top. Go left over another yellow platform to reach Hat 3/3 before returning to open the double locked gate. Cross over the moving yellow platforms and exit the other side, out here you'll find a few Chompies and a yellow platform that moves up. Ride it up to some Raven Slicers and then get across some spikes to a couple of bounce pads and then an ambush area. The enemies this time will be joined by a Raven Summoner who when there are other enemies nearby will power them up a bit but by himself he will just fire blasts of magic at you. After opening up the monster gate go left to grab a bomb behind some more enemies and throw it at the gate to the right. Grab another bomb and then ride the yellow platform up to a second one and then to the top where you'll see a gate to blow up again. Behind there is a safe, you need to rotate the symbols so that they've all got the Gem symbol facing towards you. That is Treasure Chest 5/5 by the way. Go to the right past some spikes to grab the key and jump down to open it up. In the right house is a Mabu who wants to play Skystones, you'll have to beat him to get his key. Remember to replay him for extra Skystones (Bird Chopper, Elf Archer, Goo Chompy 2). After beating him go into the left house and defeat a few enemies to grab their key. The gate is triple locked so you still have to find another, outside there's a bounce pad on the left side which leads to some more enemies with the key behind them. Go through the locked gate and up the path. As you ride the yellow platform across jump over to the left side and collect Nightmare Page 3/3. Jump over to the right side and throw the bomb at the gate and then ride the elevator up to Spike McPokerton. 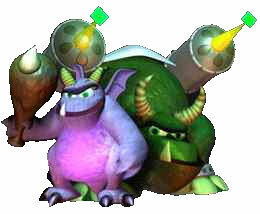 Spike's attack is to run towards you, lift his sword up and then start spinning rapidly. Move away as quickly as you can to avoid getting hit and then return to keep attacking him. Swirl him to capture and finish the level by walking into the swirling vortex. After returning to the Eternal Archives you'll be introduced to the Traptanium Vault, there you can switch which villain you are using and can play Skystones against them to win a special Skystone (you need to return a villain that you're using before you can play against them). The controls for this part are to press Y to chop the watermelons that approach and X to deflect the bombs that are being thrown. The first one is just to the right, a Mabu ship will pop up and fire off a bomb, hit it with the X button to deflect it back and destroy the ship. Further rooms will add more ships and then the floor will be moving, and then turn slippery. For the moving one make sure to stand on the side moving in the direction you're looking to move and on slippery one try not to slide too far across otherwise you won't make it back in time. Finishing this will open up the Collection Chamber where you can go view your Skylanders and hats. Immediately you see the villain of the level, Birdo Chesterfield, once you're in control again go to the right up some steps to a moving blue winged block. To get past it just jump over it, standing on top of it will bounce you but that's not of any use just yet. Go up the stepped platforms behind it and grab the Nightmare Page 1/3. To the right are a few enemies standing by a spike trap, jump over the gap behind it to get to a fight with several waves of the same enemies you've been facing already. After the fight continue to the right and play an optional game of Skystones (prizes: Troll Cannonhead, Raven Summoner 3, Raven Slicer 2). Up on the platform next to him is another of those moving blocks, jump onto it and use the bounce to reach the ledge above. Smash through the fence and ride the first yellow platform to the right to get Treasure Chest 1/5. Get back onto the yellow platform and ride it back across to a second one that goes upwards. After defeating a few enemies take the left path onto a small yellow moving platform and then over some spikes, a couple of Cross Crows will be guarding Hat 1/3. Go back and to the right up the steps that appear and onto a bounce pad. Get the moving block over to the left side of the area and bounce on it up to the left, jump the spikes and the yellow platform to reach Treasure Chest 2/5. Back over and down to take the moving block to the right and bounce up to the key, grab it and unlock the gate below. Defeat a few enemies and take the left path, on the corner is Nightmare Page 2/3 and at the back is a Lock Puzzle. Inside the building you'll find a bomb, you can just about cross safely getting in but you'll have to jump over the spikes to get out. Take the bomb outside and throw it at the wall behind where the enemies were before to smash a Traptanium Crystal with Treasure Chest 3/5 underneath. Off to the right and onto a bounce pad. This next set of enemies ends with a large crow known as a Cuckoo Clocker. This larger crow enemy will run up to you and try to punch you, sometimes he'll throw both fists into the air and smack the ground causing two waves of energy you will want to jump over. Once you've beaten him the gate will open and let you through to a bounce pad with the first piece of the cannon on. The bounce pad at the start of the level is now usable so use it. Defeat a couple of Summoners and go to the right to find the Water Elemental Gate. The water on the floor will try to push you off the edge so either jump or keep moving in the opposite direction as you cross. If your Skylander has a ranged attack try to destroy the mines before you get close. Keep following the path and you'll get to a part where the water is flowing directly towards you, there you'll want to keep running and jumping forwards while avoiding/destroying the mines. It's quite far but you'll eventually make it to the Hat 2/3 at the end. Go back to the left and up the steps to a bounce pad. Before doing anything with the blocks jump off to the left where you'll find Hat 3/3 down below. Bounce pad back up and then use the right block to get up onto the first of the platforms on the right, on it you'll get Nightmare Page 3/3. Drop off and take the block further along to bounce up for the key. Jump over the other moving block to reach the locked gate. Partway along the path of the moving platform you need to jump over a moving block to reach a Traptanium Crystal infused Treasure Chest 4/5. Get back onto the yellow platform and go left. Go up the steps and bounce over some spikes to reach a small fight with some Summoners. After beating them go right up the yellow platform and then to the right along another one, this one goes underneath platforms so you'll have to jump onto them while it passes. The fight that ensues at the end completes with a couple of Cuckoo Clockers, once they're dead follow the path out to a series of bounce pads. Go left when you land and keep on going left with the moving block all the way to the end. Use it to bounce up to a bounce pad and then up to the Treasure Chest 5/5 which requires you to align the Gem icons again. Back down once again take the block to the right and bounce over to get the key, unlock the door and bounce down to a fight with Birdo Chesterfield. Birdo has a couple of attacks, the first one he just creates three Buzzer Beaks who will try to attack you, and the second attack is to throw three Buzzer Beaks out, avoid them as they just damage you. Attack him when you can and capture him. Go up the steps that appear to get the second part of the cannon and bounce back to the start again. Approach the fixed cannon behind the mabu and get in but be prepared to start using the touch screen. The game won't give you much time to get used to the switch in controls so quickly aim the cannon with the touch screen and just keep moving the cursor around pointing it towards the birds as they appear along the wall - try not to let the Buzzer Beaks distract you from watching the Cross Crows appear. Shouldn't take too long and you can shoot down the projectiles being fired at you so you should be able to get the check marked off. Go through the door to end the level. The mechanics of this level are as follows: hide in the leaves to avoid being spotted by the mabu, the lights on their hats show you their line of sight but if you get too close to them they'll spot you anyway, press X near a nest to summon a bird that will bring a mabu over to the nest where they will be distracted (move away from the nest to avoid getting spotted) - they will still be able to detect you if you get close but they'll stop moving around, press Y to shoot at targets to open the exit gate. That's about it, just run past the mabu when they turn away if there's no nest to distract them with. The starting room first has a stationary mabu turning around, wait in the bushes until he turns away and then run forwards to the second bush as soon as he turns. For the second mabu wait for him to walk past towards the right before running to the left bush and shooting the target on the wall to open the exit. Again wait for the mabu to start going to the right before following along behind him to get to the door. In the first room there is a nest just past the bush, first shoot the target on the right (the mabu can't see this far) and then press X next to the eggs before quickly moving into the bush to wait for the mabu to move over to the nest. Once he's there go to the exit. In the second room go to the bush and wait for the left mabu to turn to the right so you can run to the left bush and shoot the target. Wait for him to turn right again to run back to the first bush. The second mabu is a little trickier, you'll have to run in to the nest when he turns left and quickly set down the distraction before going back to the first bush again. Wait for him to be distracted fully before going to the exit, the other mabu can't see that far so don't worry about him. For the third room wait for the mabu at the back to start walking away from you, he'll walk past the nest so don't run in too quickly. Once he does turn around and go back past the nest go to it, put a bird there and go back to the bush again. Go past him to the closed exit and wait for the left mabu to turn to the left, go to the bush and fire at the target, wait for the mabu to look left again and then exit. Room four, first wait for the mabu to turn left before advancing to the second bush, poke out of the bush as soon as the patrolling mabu starts walking away and use the nest, duck back into the bush to wait for him to move out of the way so you can go past. The mabu at the back cannot see as far as where the nest is so just walk past, use the nest and then go back to the right just past the corner to wait for the mabu to go to that nest. The bush by the target is a bit pointless here but hit the target and walk on out. In room five walk behind the first mabu and use the nest on the right, go back to the bush to wait and then as usual go past him. The target is at the top by a bush, hit it and then go to the left bush to wait for the next mabu to turn left so you can place a bird in the nest next to you. The exit is just past where he was. Room six you need to wait for the mabu to turn before you do anything, when he does go left to a second bush and wait for the top left mabu to turn and walk away from you. Use the nest on the left and duck back into the bush. Careful now as you go past the closed exit as the first mabu's turn will move left so don't stand more towards the corner than the exit while you wait. Once he has fully turned go past to a bush and a nest to distract the right mabu. You now have to go all the way around to the left and back past the start - don't try to squeeze past the nest as he will spot you. Once you've got around the course hit the target on the right and then again go all the way around to the exit to finish. Go into the Temple of Waking and down the steps to where there's a blue block with red and yellow markings blocking the way, walk towards the screen and to the right to hit a switch that moves that block out of the way so you can get to the teleporter just past it. Baron Von Smashbeak is introduced here but the ambush just contains more of the same enemies you've been fighting before. Once they'll all gone go through the exit. Go right to another ambush with similar enemies, once they're gone go northwards to a switch that moves the block on the right. After teleporting go to the next switch but drop off towards the screen to find Hat 1/3 sitting just below. Hit the switch and then teleport over to the two blocks you moved (the teleporter here just teleports you back, I guess in case you didn't hit the switch). Anyway, go past the blocks to the right, past a few enemies and use a bounce pad to get up to one of those Gem symbol safes Treasure Chest 1/5. Once you've cracked the code jump down to finish off any remaining enemies before going through the exit ahead. Go to the right over the top of one of those blue blocks and defeat a set of four enemies, once gone follow the yellow line towards the screen and to the right through a smashable barrier to a switch. That switch will move a load of blocks including the one you just jumped over, go back to that one and drop down to where the block was to find Hat 2/3. Bounce back up and hit the switch again, this will slowly raise up the block to your right, quickly jump onto it as it goes up to ride up to Treasure Chest 2/5. Drop back down to the left, hit the button again and cross over the set of four spikes again, on the third block follow it towards the screen to collect Nightmare Page 1/3. Back along that block and to the right, go over the spikes to get a glimpse of Baron Von Smashbeak again, defeat the enemies that appear and then make your way around the corner to a teleporter that'll take you a short distance to another of those Lock Puzzles. At the blue block inside follow the yellow line towards the screen and then up around to a switch past a fire grate and some spikes. Jump over the gap that the block reveals while avoiding the fire that spews out of the lava below and then fend off another ambush that ends with a couple of Cuckoo Clockers. Go right and then towards the screen over some spikes to a switch, this lowers several blocks again. Go back to the left a little to use a block that lowered to reach Nightmare Page 2/3 in the corner of the area you just fought in. Go right over the gaps that have appeared before taking out a few last enemies by the exit. Defeat a lone Cuckoo Clocker and then jump over some spikes to smash a Traptanium Crystal with Treasure Chest 3/5 inside. To the right is a Mabu who would like to play some Skystones with you, totally optional (aside from needing to for the star). Skystone rewards are Elf Archer 3, Elf Healer 2, Troll Facebasher 2. Hit the switch to the right over the spikes and then go along the blue block towards the right, jump up to a platform with a spike and Treasure Chest 4/5 on. Now along the block again to the left to some Chompies. Jump the small gap to get to yet another ambush, be careful of the middle as it blasts out fire - for the challenge this is a Fire Trap, you simply have to lure enemies over it while it's flaming, three and you're done (obviously only the ones that move around are going to be useful so don't attack them directly). Once they're all gone jump the gap to the right and hit a switch. That creates a set of stairs that lead up to an exit. Outside follow the yellow line to a bounce pad which leads to a switch, go over the lowered block and then over some spikes and through a barrier to get to an ambush, again watch out for the central flame. After defeating those enemies jump up a small ledge to a teleporter and hit the switch it takes you to. Go right to a teleporter back. Hit the switch to the left and then drop off the right side to a Traptanium Crystal with Treasure Chest 5/5 underneath. The teleporter here is a bit useless as you can just jump back up. To the left of a row of three Cross Crows is the Earth Elemental Gate. Grab the bomb on the left and run forwards to the bombable gate ahead. Ignore the bounce pad as it just takes you back if you need to get another bomb. Carry on around the corner to the left and grab another bomb, take it over the moving block and up the steps to the gate. After smashing that grab a third bomb ahead and use the next moving block to get up onto the platform with the third gate. Another left turn, grab the bomb and start running forwards, use the blocks to bounce over the gaps to the gate. The last segment just requires you to bounce along a series of platforms, aim to land on them yourself as it won't do it automatically. At the end is Hat 3/3 for you. Go right over some spikes and keep on going right to fight Baron Von Smashbeak. His attack pattern is exactly the same as the Cuckoo Clockers you've been fighting, he runs up to you and punches once, he'll do that again and then the next time he'll smash the ground a few times causing shockwaves you need to jump over. All he really has is a bit more health perhaps. After beating him go further right to hit a switch and grab the Nightmare Page 3/3. Go back to the left and go up the steps just before where you fought Baron Von Smashbeak, the blocks will now be popped out of the wall for you to continue on upwards. Go on through the doorway to your first fight with the main villain, the Dream Sheep. For the first section of the fight you need to first move to the left to avoid the Sleep Dragon's tail, jump over a shockwave when he lands and then jump over the tail as he swings it in a circle (stand towards the edge to avoid it as it stops). He'll then slam his tail down and it'll get stuck in the ground. Run over to it to knock it back at him and hit the Dream Sheep off his back. While the Dream Sheep is on the floor attack him all you can. Once he jumps back on the Sleep Dragon will fly up and drop in some minions to fight. Once those are gone he'll slam down and cause a couple of shockwaves you need to jump over. He'll then repeat the rest of his previous actions except he'll do each of them twice in a row. Once he gets his tail stuck again hit it and then attack the Dream Sheep some more. One last set of minions and a repeat of before but with three of each move. Hitting the tail back and attacking the Dream Sheep will finish the fight... for now. Tap the bell on the touchscreen to finish the level. The spinning thing on the ground is the thing you're looking for, walk up to it and press the X button to perform a shockwave attack, hit the bomb with your Y attack to knock it into the statue blocking the door. The first room just has six small dolls to Y smash. The second has three small dolls and two big ones, to get both the big ones in one hit stand between the two bombs and hit them both with the same shockwave and punch attacks. In the third room stand right in the middle of the four bombs and then hit each one one by one with your punch attack, they should stay in the air long enough to do that. The next room has a load of small and a moving bomb at the end, just shockwave it up and hit it as usual. The next one has two moving bombs, you'll want to try to get them so they're not in a line otherwise they'll both go to the same doll (they'll reappear so it's not a big problem). The room after that also has two moving bombs but you can get inbetween them and hit them individually to the left and right. The room with three bombs you should wait for all of them to be closest to the dolls before performing a shockwave attack, then just knock them each into the dolls. The eighth room has four bombs, wait for the moving ones to approach a side and then shockwave all four, that should let you hit each of them into dolls. And the final room has another four bombs, you can get them all in one shockwave when they all meet up in the middle.